Fig. 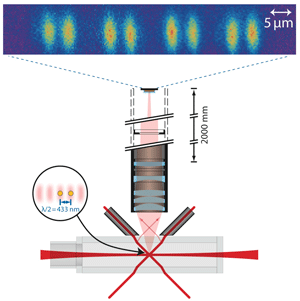 1: The vacuum cell with lattice and imaging system: Individual cesium atoms can be trapped and observed. Our team is working on quantum information processing using a small number of Cesium atoms. We load the atoms into a 1D optical lattice and use the spin of each atom as a quantum bit, with the ability to set and read out each atom individually—a quantum register. Our lattice uses a special wavelength which makes the optical potential state-depedent, giving us the ability to shift atoms in the lattice depending on their internal state. We are currently researching the phenomena exhibited by a single atom when it is coherently separated over several sites. Ultimately, our goal is the controlled interaction of two atoms, creating entanglement that can be used in a quantum computation.